Elegant user interface, reliable performance. The perfect spreadsheet for every type of data. 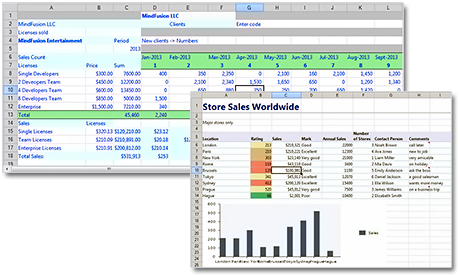 A powerful .net spreadsheet component with great capabilities for editing, styling and formatting large amounts of data. "I have replaced the free spreadsheet in merely 1 day. Unbelievable. The program is nearly 2 MB smaller and MF Spread is way faster." MindFusion WinForms Spreadsheet control enables your .NET application to perform a broad range of editing, styling and formatting operations in an Excel-like environment without the need to install MS Excel or use Excel Automation. 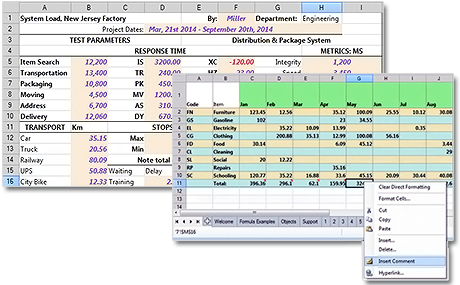 You can enjoy the familiar Excel workbook interface with a variety of options for calculating formulas, adding and customizing charts, saving and loading files. There is no limitation on the number of sheets you can add to a workbook. You can change sheet order by dragging a sheet with the mouse, rename or scroll it. Each sheet can have as many rows and columns as you need. Once you are ready editing your workbook, you can print it, save it as an XML or MindFusion workbook file. The spreadsheet component includes a full-featured chart control. Choose among a variety of charts to present your spreadsheet data in an intuitive and easy-to-understand manner to the users. At your disposal are numerous chart settings, neatly organized in an auxiliary chart form. Each chart can have a legend, title, unlimited number of series, customizable pens and brushes. Chart labels and data are bound directly to the spreadsheet rows and columns. MindFusion WinForms Spreadsheet control offers you numerous style and formatting options that will answer even the most demanding scenarios. Cells can be merged, with each cell having its own data formatting, borders and shades. Fonts are completely customizable, rows and columns support the standard formatting options for height and width. Data can be formatted in different ways depending on its type - numbers, currency, date and time etc.